It’s true, this book has style. And it covers all the elements from css and typography to html and the structure of prose. But, if we focus too narrowly on the conjunction and the comma, we may lose sight of the composition. So let’s return to the runt who becomes “some pig” thanks to the writing in Charlotte’s Web. Wilbur and his spider friend, Charlotte, teach us about loyalty and friendship in a way that touches all readers, young and old. 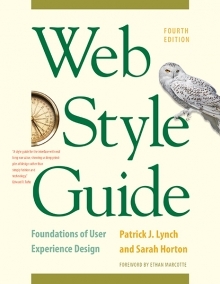 In similar fashion, Web Style Guide delivers value and meaning to seemingly disparate audiences, from the student prodigy who would be webmaster to the grizzled veteran information architect who’s been there and organized that. For the beginner, this book teaches the fundamentals of interface design, information architecture, and usability without unnecessary complexity or jargon. It’s the clearest, most practical guide to Web design you’ll find. After all, concern for people lies at the heart of design. We lift ourselves up by helping others. As Charlotte explained to Wilbur at the end of her story, “I wove my webs for you because I liked you.” Isn’t that our story, too?